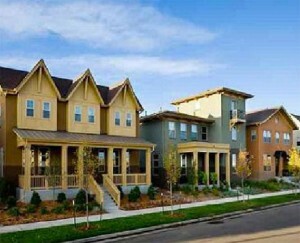 Stapleton is one of the greenest neighborhoods in the Denver area. The neighborhood is located on the site of the city’s old airport, but there are no signs of its past in the peaceful, clean streets and parks that are to be found there today, unless it is in the inspiration for the “Airfoils” sculpture that stands in the civic plaza. This piece of art was created from recycled airplane parts. The architecture, green spaces, and public artwork have all been created with the beauty and sustainability in mind. The redevelopment from the airport, which is still ongoing, ha been carefully planned in order to create a new sustainable community. Stapleton is now an idyllic suburb, with its own shops and restaurants, open space and other recreational facilities, and new family homes. The neighborhood has a wide variety of different stores and restaurants. The main commercial areas are at Quebec Square, the Northfields at Stapleton shopping center and the East 29th Avenue Town Center. Almost a third of the neighborhood has been set aside for recreational purposes. The neighborhood has an abundance of green space, including the Central Park that lies at the heart of the community. Although it is one of the newer neighborhoods in Denver, Stapleton has a vibrant and active local community.